From gizmos to trinkets: the era of smart jewelry is upon us, with makers and businesses of all stripes and sizes busy mixing electronics and sensors with ‘fashion-friendly’ designs intended to be displayed proudly on the person. Sure your Fitbit wristlet is technically a wearable but it’s not going to be garnering aesthetic attention and is probably intentionally tucked under your cuff. (Perhaps to hide the rash it’s given you…). And so another category of wearables is hoping to push in here — trying to convince consumers to shell out for a trinket whose primary ‘smart’ is the ability to change how it looks, mostly just for kicks and/or notifications. Last fall, for instance, Sony outed a minimalist e-paper smartwatch, called the FES Watch. It’s due to ship later this year. The watch face and band designs can customizable by the user, thanks to the use of low-power e-ink tech. 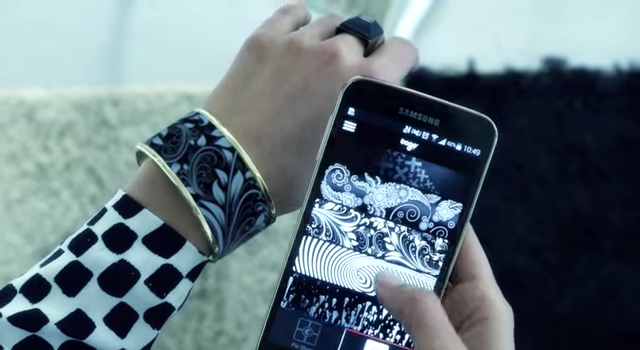 This is e-ink as a fashion fabric. And that’s just the vanguard. E-ink’s low power consumption gets round the primary problem of current gen wearables: sucky battery life. So expect a whole lot more of this pattern-shifting stuff to start cropping up. To wit: tago arc — an e-ink bracelet in the making. Its makers are currently passing round the donations bowl on crowdfunding site Indiegogo to raise $40,000 to turn their prototype into a shipping product by next December. So, to be clear, tago’s twist is that it needs (and has) no on-board battery. The NFC draws the power it needs for a transfer from the mobile device’s battery as and when the user is changing the design. When in its resting display state, e-ink does not draw power so no battery is needed to power the device at other times — so it’s a battery-free wearable. Or that’s the promise. If you’re feeling a sense of deja vu, that might well be because we saw a very similar looking smart, e-ink bracelet — which also lets the user change the display designs — at our hardware battlefield at CES, back in January. 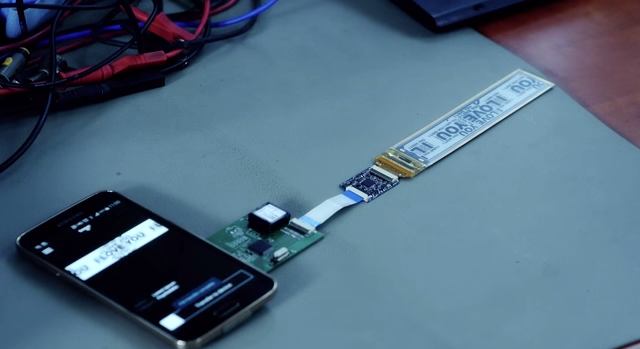 That prototype device is being made by LookSee Labs. You can see it demoed in a video from our battlefield session. The main difference being that LookSee Labs’ smart bracelet does have an on-board battery — albeit one that its makers reckon is good for about a year’s use. So it does need charging, at least irregularly, but can also support more power intensive functionality such as slideshows. Not so the tago arc. Although it’s charge-free, the tago arc won’t win any speed (or slick interface) awards for how quickly designs can be transferred to the bracelet (the process currently takes about 15 seconds, and the NFC tags need to be correctly aligned throughout so it’s a tad fiddly). But the team is promising transfer times will be sped up by around 4x in the finished product. The bracelet itself will be made from coated surgical stainless steel, with gold, silver and black color options. The basic price for Indiegogo backers is now $259 per bracelet. Precious metal premium versions are also offered — at far higher cost.